At the top of the yoke some short rows are worked to lower the front neckline. 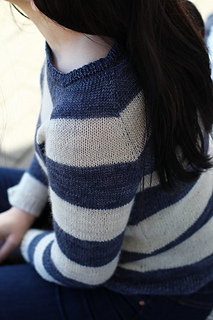 When the neckline shaping is complete the yoke is worked in the round and it is shaped with a raglan shaping where the increase rates vary. 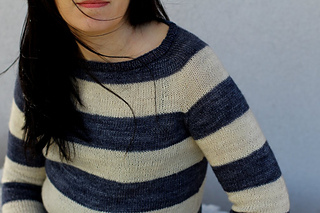 The result is a hybrid of a raglan and a saddle shoulder. 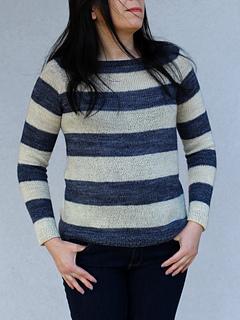 Knit this pullover in one colour for a basic garment or follow the stripe sequence for the 2-colour version. 78 (83.5: 87.5: 92.5: 98: 103.5: 109: 114.5: 118: 123.5) cm / 30¾ (33: 34¼: 36½: 38¾: 40¾: 43: 45: 46½: 48¾) inches bust circumference at underarm. Intended to fit with approx. 6-7.5 cm/2¼-3” positive ease at bust. Sample shown is size S2 with approx. 6.5 cm/2½” positive ease at bust using The Plucky Knitter Sophisticate (50% merino, 30% mohair, 20% silk; 466 m /510 y per skein) in colourway Choo-Choo as C1 and Twill as C2.